China To End Organ Harvesting From Executed Inmates : The Two-Way The controversial practice has long been criticized by human rights campaigners who say that it could hasten the pace that prisoners are put to death in China. 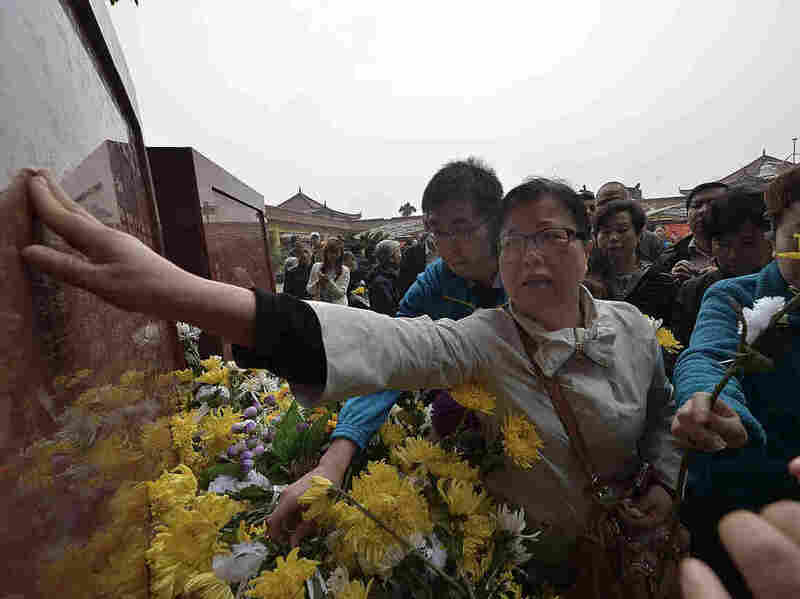 Relatives of deceased organ donors mourn for them at a ceremony unveiling a monument for the organ donors in April in Chongqing, China. China says it will halt the controversial practice of harvesting human organs for transplant from executed prisoners beginning on Jan. 1 in what The New York Times describes as "the firmest deadline given to date for ending" the practice. Human Rights activists have long charged that taking organs from condemned prisoners could have the effect of hastening the pace of such executions — especially since China's supply falls far short of the need for transplant surgeries. China already puts to death more prisoners than any other country, a figure that Amnesty International guessed at last year as in the "thousands." In 2012, Beijing announced that it would phase-out the practice as part of a larger move to overhaul its organ transplant system, with the aim of abolishing it within five years. The Wall Street Journal reports that "[while] China already forbids organ donations without the consent of the donor or the family, critics have said inmates can feel pressured to sign away their organs and that the source of organs isn't well supervised. "Officials have previously said that China depended for years on executed prisoners as its main source of organ supply for ailing citizens. About 65% of transplants in China use organs from deceased donors, over 90% of whom were executed prisoners, according to a 2011 paper co-written by Mr. Huang [Jiefu, the director of China's Human Organ Donation and Transplantation Committee,] in the medical journal Lancet. The paper said China is the only country that systematically uses organs from executed prisoners." So far this year, organs have been collected from 1,500 people in China who consented to be donors on their deaths, according to WSJ. "That exceeds a total of 1,448 voluntary donors for the previous three years. "By comparison, last year in the United States, with a smaller population, 14,256 people donated organs, including 8,268 deceased donors and 5,988 living donors, according to the United States Department of Health and Human Services."